116:2.13 By the technique of mortal logic it might be inferred that the experiential reunification of the collective acts of the first three levels of God the Sevenfold would equivalate to the level of Paradise Deity, but such is not the case. Paradise Deity is existential Deity. The Supreme Creators, in their divine unity of power and personality, are constitutive and expressive of a new power potential of experiential Deity. And this power potential of experiential origin finds inevitable and inescapable union with the experiential Deity of Trinity origin—the Supreme Being. <p 116:6.1 In the evolutionary superuniverses energy-matter is dominant except in personality, where spirit through the mediation of mind is struggling for the mastery. The goal of the evolutionary universes is the subjugation of energy-matter by mind, the co-ordination of mind with spirit, and all of this by virtue of the creative and unifying presence of personality. Thus, in relation to personality, do physical systems become subordinate; mind systems, co-ordinate; and spirit systems, directive. 116:7.3 Mind has been given to mortals wherewith they may become self-conscious of identity and personality; and mind—even a Supreme Mind—has been bestowed upon the totality of the finite whereby the spirit of this emerging personality of the cosmos ever strives for the mastery of energy-matter. 116:7.5 Human beings are capable of making an everlasting self-identification with total and indestructible universe reality—fusion with the indwelling Thought Adjuster. 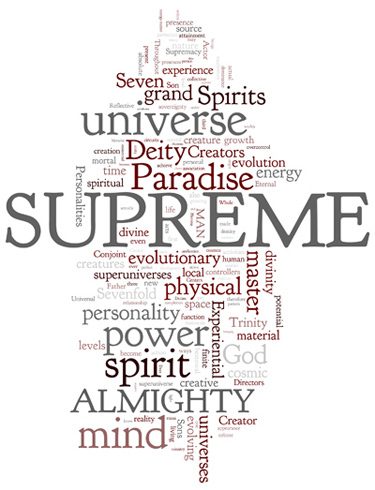 Likewise does the Supreme everlastingly depend on the absolute stability of Original Deity, the Paradise Trinity.